An adult ball python usually reaches 3 to 5 feet when mature, though a few have made it to 6 feet but this is not a usual happening. Make sure you buy a healthy snake, it's eyes should be clear and free of debris (unless it is shedding than it's eyes will look cloudy milky white to milky bluish). There should be no scarring, cuts or other obvious signs of injury or neglect. The snake should feel heavy and appear "thick" a thin python is one which has not been fed well. Their life span is 20 to 30 years on average so expect your snake to be with you quite some time. Buy captive bred not imported unless you are more experienced in pythons, captive readily eat where captive can be moody and refuse to eat until settled in which can take quite some time. Keep your ball python warm, 75 to 85 degrees is optimum, since they are a nocturnal snake the preferred heat method is a reptile heating mat since they are not usual sun baskers, if you do use a light replace an incandescent bulb with a colored bulb of either red or blue. 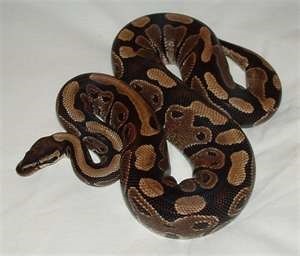 Be prepared to feed your snake on a weekly basis of 1 to 2 mice or small rats depending on your rats size. For a very small juvenile feed it pinkies atleast twice a week to keep it active, healthy and growing. Bedding should be easily removable and able to be cleaned. Newspaper or astroturf is the best bedding in my opinion for snakes to stay clean and healthy. I hope this information is useful in helping you decide if a ball python is right for you, if you have any questions feel free to ask and I will do my best to get back to you. News: Could the World Cup ball be to blame? News: Jabulani, the new toy.